Volcanoes are outstanding natural sources of infrasound (low-frequency acoustic waves below 20 Hz). In the last few decades local infrasound networks have become an essential part of geophysical monitoring systems for volcanic activity. Unlike seismic networks dedicated to monitoring subsurface activity (c.f., magma or fluid transportation) infrasound monitoring facilitates detecting and characterizing eruption activity at the earth’s surface. 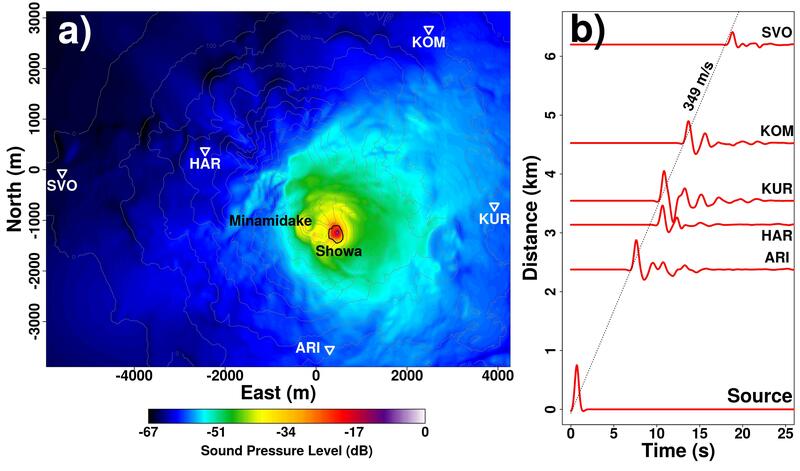 Figure 1a shows Sakurajima Volcano in southern Japan and an infrasound network deployed in July 2013. Figure 1b is an image of a typical explosive eruption during the field experiment, which produces loud infrasound. Figure 1. a) A satellite image of Sakurajima Volcano, adapted from Kim and Lees (2014). Five stand-alone infrasound sensors were deployed around Showa Crater in July 2013, indicated by inverted triangles. b) An image of a typical explosive eruption observed during the field campaign. One of the major sources of volcano infrasound is a volume change in the atmosphere. Mass discharge from volcanic eruptions displaces the atmosphere near and around the vent and this displacement propagates into the atmosphere as acoustic waves. Infrasound signals can, therefore, represent a time history of the atmospheric volume change during eruptions. Volume flux inferred from infrasound data can be further converted into mass eruption rate with the density of the erupting mixture. Mass eruption rate is a critical parameter for forecasting ash-cloud dispersal during eruptions and consequently important for aviation safety. One of the problems associated with the volume flux estimation is that observed infrasound signals can be affected by propagation path effects between the source and receivers. Hence, these path effects must be appropriately accounted for and removed from the signals in order to obtain the accurate source parameter. Figure 2 shows the results of numerical modeling of sound propagation from the vent of Sakurajima Volcano. The sound propagation is simulated by solving the acoustic wave equation using a Finite-Difference Time-Domain method taking into account volcanic topography. The synthetic wavefield is excited by a Gaussian-like source time function (with 1 Hz corner frequency) inserted at the center of Showa Crater (Figure 2a). Homogeneous atmosphere is assumed since atmospheric heterogeneity should have limited influence in this local range (< 7 km). The numerical modeling demonstrates that both amplitude and waveform of infrasound are significantly affected by the local topography. In Figure 2a, Sound Pressure Level (SPL) relative to the source amplitude is calculated at each computational grid node on the ground surface. The SPL map indicates an asymmetric radiation pattern of acoustic energy. Propagation paths to the northwest of Showa Crater are obstructed by the summit of the volcano (Minamidake), and as a result acoustic shadow zones are created northwest of the summit. Infrasound waveform also shows significant variation across the network. In Figure 2b, synthetic infrasound signals computed at the station positions (ARI - SVO) show bipolar pulses followed by oscillations in pressure while the pressure time history at the source location exhibits only a positive unipolar pulse. This result indicates that the oscillatory infrasound waveforms can be produced by not only source effects but also propagation path effects. Hence, this waveform distortion must be considered for source parameter inversion. Figure 2. a) Sound pressure level in dB relative to the peak pressure at the source position. b) Variation of infrasound waveforms across the network caused by propagation path effects. Because wavelengths of volcano infrasound are usually longer than the dimension of source region, the acoustic sources are typically treated as a monopole, which is a point source approximation of volume expansion or contraction. Then, infrasound data represent the convolution of volume flux history at the source and the response of the propagation medium, called Green’s function. Volume flux history can be obtained by deconvolving the Green’s functions from the data. The Green’s functions can be obtained by two different ways: 3-D numerical modeling considering local topography (Case 1) and the analytic solution in a half-space neglecting volcanic topography (Case 2). Resultant volume histories for a selected infrasound event are compared in Figure 3. Case 1 results in gradually decreasing volume flux curve, but Case 2 shows pronounced oscillation in volume flux. In Case 2, propagation path effects are not appropriately removed from the data leading to misinterpretation of the source effect. 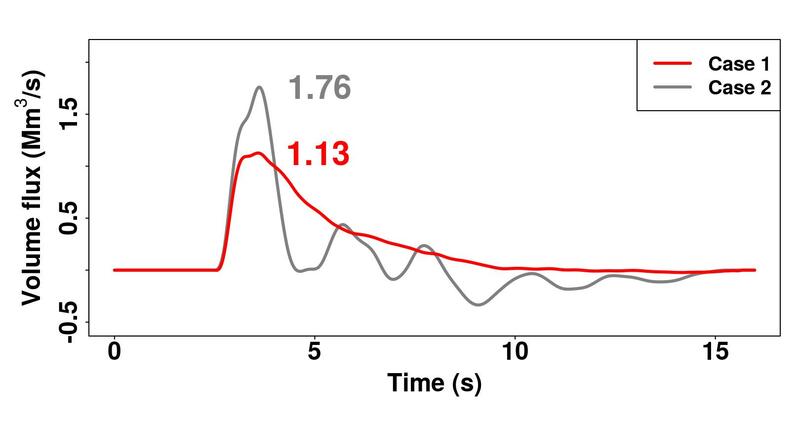 Proper Green’s function is critical for accurate volume flux history estimation. We obtained a reasonable volume flux history using the 3-D numerical Green’s function. In this study only simple source model (monopole) was considered for volcanic explosions. More general representation can be obtained by multipole expansion of acoustic sources. In 169th ASA Meeting presentation, we will further discuss source complexity of volcano infrasound, which requires the higher-order terms of the multipole series. Figure 3. Volume flux history inferred from infrasound data. In Case 1, the Green’s function is computed by 3-D numerical modeling considering volcanic topography. In Case 2, the analytic solution of the wave equation in a half-space is used, neglecting the topography.